(Bloomberg) – South Africa is getting down to the business of fixing its debt-ridden state power utility. Eskom Holdings SOC Ltd. had R399 billion ($30 billion) of debt at the end of March, according to data compiled by Bloomberg, and has been flagged by ratings companies as a key risk to South Africa’s economy. The utility has been mired in a series of scandals, struggled to raise funds and was forced to implement rolling blackouts last month after wage talks with unions broke down. Eskom announced Tuesday it’s secured a $2.5 billion long-term loan facility from China Development Bank, giving a big boost to its fundraising efforts this year. About an hour later, a top official in the ruling African National Congress told reporters the Public Investment Corp. is in talks about converting part of the debt it is owed by the state power utility into equity. 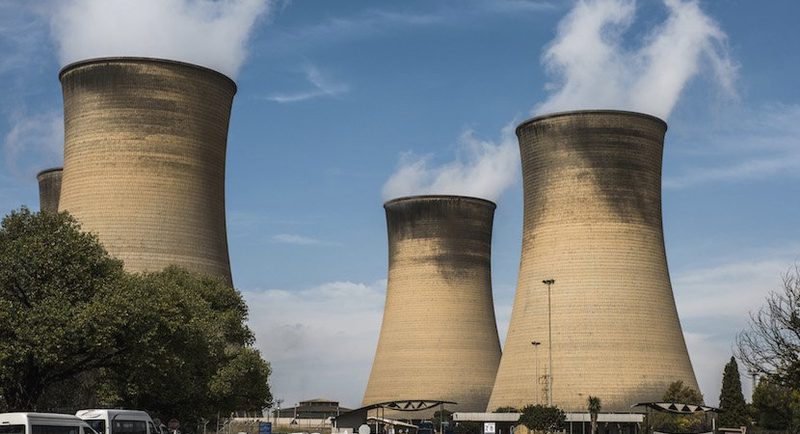 “We’re seeing sufficient signs that management at Eskom cares about dealing with the problem and we’re seeing progress,” said Darias Jonker, an Africa analyst at risk-advisory firm Eurasia Group. The moves are “a sufficient encouragement that Eskom is too big to fail and that a default is unlikely,” he said. The CDB loan was announced as part of a series of investments by China in South Africa after a meeting between President Cyril Ramaphosa and his Chinese counterpart, Xi Jinping, in Pretoria. The facility takes Eskom’s secured funding to more than 60 percent of requirements for this year, Chief Executive Officer Phakamani Hadebe said. Yields on Eskom dollar bonds due 2021 dropped 18 basis points to 6.83 percent. Also on Tuesday, Paul Mashatile, the ANC treasurer-general, said that the party favours splitting Eskom into three parts – electricity production, transmission and distribution. Mashatile also revealed that the PIC, which oversees South African government workers’ pensions, is in talks with the government and Eskom about converting part of the about R100 billion of the company’s debt it owns into equity. The move would support Eskom’s balance sheet and allow it to raise more money, he said. Eskom’s debt is projected to increase to R600 billion within four years, the company said on Monday. It reported a loss of R2.3 billion for the year through March and said it discovered R19.6 billion in irregular costs, a liability largely inherited from previous leadership. The utility is also still in wage negotiations with unions, after backing down on a refusal to offer pay increases following last month’s protests. Eskom may consider a liability management exercise for its dollar bonds due 2021, people familiar with the matter said on Monday, asking not to named because the talks were private. Liability management involves debt investors agreeing to changes such as maturity extensions or discounted buybacks. While the latest announcements show a determination to tackle Eskom’s problems, there’s still a long way to go, said Eurasia’s Jonker. “Stabilising Eskom is still very far from being realized,” he said.